I decided to study at City for the incredible lecturers whose tutelage and advice were unparalleled. Can you tell us a bit about what you're doing now? 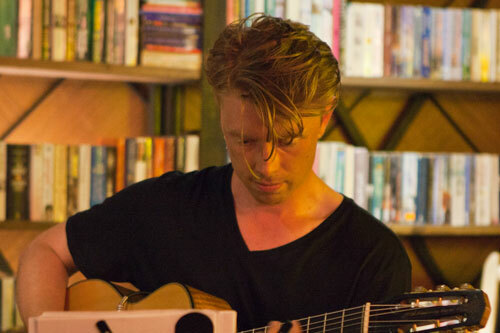 I am currently a performing guitarist for various jazz ensembles in London and since graduating I have performed at the Royal Albert Hall, The Royal Academy of Art, and Shoreditch Town Hall. I am employed as a composition and guitar teacher at Barrow Hill Junior School and most recently the Royal Greenwich Music Hub. I have composed for the international feature film, Fault (2015) and previously worked as a studio technician for Brains and Hunch, Music for Moving Image. Why did you decide to study at City, and how did it help you get to where you are today? I decided to study at City for the incredible lectures whose tutelage and advice were unparalleled. I also studied at City for my undergraduate degree and was therefore familiar with the exceptional level of expertise available. The most enjoyable aspect of studying for an MA at City was meeting fellow students who have become great friends, contacts and musicians to work with. Were there any lecturers who particularly inspired you? Diana Salazar, Newton Armstrong and Stewart Hall were all a lasting inspiration to me and provided me with the most fascinating education at City. What are your long term career plans? My long term career plans are to continue teaching, performing and composing. Do you have any advice for someone who might be considering this course? Make the most of everything City has to offer! Find out more about Joe on his website.